Almost everyone, your users included, relies on the internet for almost everything. As a result, content marketing is a key component of many digital marketing strategies. According to WordStream, more than 500 million hours of video are watched on YouTube daily. In fact, YouTube has over a billion users. And did you know marketers who use video grow revenue 49% faster than nonvideo users? Shawn Anderson, cofounder and CEO of PDQ.com, got the memo about using content-rich videos to engage clients and grow revenue. He and his team have steered clear of the old faithfuls of outbound marketing including print ads, AdWords, banner ads, and the like, and focused solely on content marketing. Doing so has helped the company achieve 59 percent growth and 55 percent profit margin last year with no signs of slowing down. Back in 2011 when PDQ.com was officially launched as an IT systems management software solution for the SMB market, Anderson and his two cofounders had no intention of using “traditional” marketing to build the business. Indeed, they avoided anything considered to be “outbound” marketing, such as radio, print, or television ads, because these types of ads reach people who may not be interested in what PDQ offers. “Look, traditional marketing works, or people wouldn’t use it,” he explains. “We just find traditional outbound marketing to be very expensive, and we were interested in reaching our clients in other ways.” PDQ also avoids banner ads and even Google’s AdWords for the same reason — to them, the expense seems far greater than the return. PDQ has spent a great deal of time and money — a quarter of a million dollars to be exact — to develop and produce their live webcasts. Every Thursday at 10 a.m. MST, PDQ airs its live webcast on its website. The audience typically includes about one hundred IT administrators (up to about 500 view the webcast once it’s been posted to YouTube — more on that later). Each webcast features two or three of the company’s IT employees (referred to as “talent” for webcast purposes) who discuss a specific topic, which is predetermined and chosen by both the marketing and solutions teams. The two teams work to develop topics on anything from recent incoming tickets, to timely industry topics and trends, to tutorials on how to use and integrate features and functionalities of an upcoming release. “Here’s an example — our marketing team will talk to our solutions team about the fact that some of our users are having problems writing a custom SQL code, and so they may decide to produce an on-demand video and then follow it up with a live webcast,” explains Anderson. From there, the two teams must determine whether they have enough content for a 30-minute webcast (live webcasts are 30 minutes minimum, 40 minutes maximum), meaning they need at least 15 minutes where the IT team can talk on their own, plus another 15 minutes’ worth of viewer engagement and questions. Anderson asserts that with a user base of more than 200,000 free users and well over 19,000 paid users, there is no shortage of topics and talking points. The topics for each webcast are announced via PDQ’s newsletter as well as on their website in advance of the live event. Viewers can submit questions either via email in advance or via the user interface in real time during the webcast. The technicians’ responses to the questions add value to the discussion and sometimes even changes the flow of the live webcast. Of PDQ’s 40 total employees, Anderson rotates about six IT employees through the webcasts based on everything from areas of expertise to personal schedules. Preparing for live webcasts is critical to their overall success, but viewers can rest assured they won’t tune in to stuffy, canned, robotic IT professionals talking shop. If you tune into the preshow, which begins at 9:30 MST, you’re likely to find the talent talking through tickets while sipping scotch. Timing and frequency play a big role in webcast success, too. If the webcasts go on for too long, viewers won’t put a standing reminder in their calendars. Yet, if the webcasts were broadcast only once a month, people would likely forget about them and engagement would drop. There are two different webcast experiences — live and postproduced. “Once the live event kicks off at 10 a.m., viewers see and hear our brief intro and then we officially begin with the talent, who are superimposed over our product,” says Anderson. “You can look at the product, or you can look at them.” Many live webcasts force viewers to stare at a PowerPoint presentation, or at a screen share where all viewers can see is the mouse move. PDQ developed its own tool that superimposes the technicians in the corner of their product so viewers can see them and the software. Viewers may submit questions, which are displayed in text onto the green screen so that viewers can read them easily. YouTube plays a big part in PDQ’s webcasts, as the entire webcast, complete with closed captioning, is available on YouTube within about two hours after the live event ends. In addition to the live webcasts, PDQ also produces videos, which can be viewed on demand. The same team that develops the content for webcasts develops content for videos. PDQ produces anywhere from three to five videos per week on very specific topics (e.g., “How to Deploy Adobe Flash to All Your Computers”). When people Google search “How to Deploy Adobe Flash,” the search results may render PDQ’s blog or webpage, both of which include a link to the video. “Our videos don’t have intros — we jump right in and show the viewer how to solve their problem. And our videos are very topic-oriented. Our talent might record four or five videos in one session, but those videos will be released over the course of two weeks,” he explains. PDQ’s videos help users answer a problem quickly and easily. They’re useful because PDQ ensures they are designed to address an IT admin’s pain points — not a Google algorithm. “My advice to anyone doing content marketing is not to worry about SEO and Google. Write for humans. Write to the person who has the same pain point that you’re addressing. State the question you’re going to answer clearly up front, and then answer the damn question,” he says. PDQ’s headquarters in Salt Lake City houses two state-of-the-art recording studios. 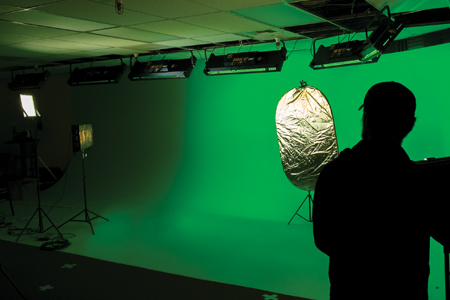 One studio is primarily for the company’s postproduced videos, which includes a green screen, microphones, lighting, and cameras. The second studio is for the live webcasts, and that studio has to have two rooms — the first is the sound room where people behind the scenes can speak to each other without being heard on camera. The sound room has a special, custom-made, double-paned, angled sound window that allows the talent to see but not hear the control team and vice versa, so technical direction such as, “Switch to camera two,” can’t be heard by the talent or the audience. The studio has five cameras for webcasts (with three additional cameras for videos), as well as a green screen. CAN VIDEOS BE DONE FASTER, CHEAPER, AND EASIER? Even after making those helpful adjustments, Anderson warns there was simply no way to conduct the live webcasts the way PDQ does them now. Because he wanted to superimpose the talent over PDQ’s product, tools such as GoToWebinar were not an option, which is why PDQ ended up building their own tool to do so.